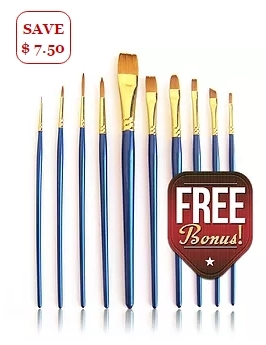 – Assorted Sizes & Brush Types Specially Chosen to Provide You with a Wonderful Range of Brush Strokes & Effects – for Acrylic, Watercolor, Oils, Mixed Media, Journalling, Face Painting & more – Won’t Shed Bristles – Easy to Clean – Affordable Quality for Artists & Beginners – Buy Your Pro Supplies Now! – Assorted Sizes for Watercolor Paint & Pencils, Brush Markers, Ink & Dye – Perfect for Painting on the go & Kids’ Crafting without the mess – fill with your favorite ink for Brush Lettering or Chinese Calligraphy – Won’t Leak making it Essential for your Artist Travel Kit! 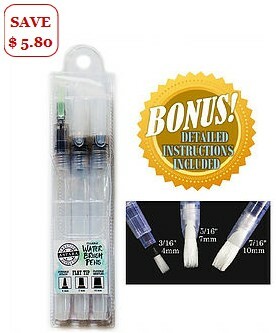 – Assorted Sizes plus the Same Great Performance and Uses as the Round Set with all the Versatility of Flat Brushes – Easy to Fill – Easy to Clean; just Squeeze & Wipe – Makes Painting Set-Up a Breeze.. no need to collect water, just Start Painting! 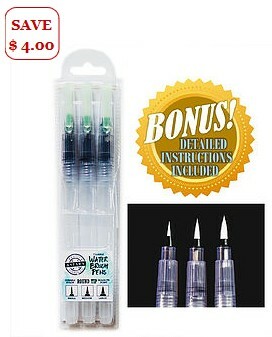 – Add Them to Your Artist Travel Kit for Painting On The Go! © Copyright 2017 Astara Creative Supply Company. All rights reserved.